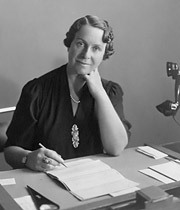 Caroline Haslett's organizational and management skills, magnetic personality and great gift of friendship resulted in public recognition very early in her career and ensured that she was in great demand for committee work and to serve on the boards of many public and private organisations. In 1930, she was the only woman delegate at a conference on power in Berlin. In 1931, at the age of only 36 years, she was awarded a CBE (Commander of the Order of the British Empire) for her services to women, and in 1947 made DBE in recognition of her work for the Board of Trade and the Ministry of Labour, making her Dame Caroline Haslett. In 1932, she was appointed the first woman Companion of the Institution of Electrical Engineers (now the Institution of Engineering and Technology). Through her work on education for both the Women's Engineering Society and the Electrical Association for Women she was asked to sit on the committees and governing bodies of several colleges and universities, including the Administrative Staff College, King's College of Household & Social Science, the London School of Economics & Political Science, Queen Elizabeth College, Bedford College for Women, and the Careers & Appointments Board of Nottingham University. She also served as president of Hillcroft College, a residential college for women. Many public appointments followed. Very early in her career she was appointed chairman of the home safety committee of the Safety First Association, and vice-president of the Royal Society for the Prevention of Accidents, both of which reflected her work on the safe use of electricity in the home. She became a member of the councils of the British Institute of Management, the Industrial Welfare Society and the National Industrial Alliance, and a member of the Central Committee on Women's Training & Employment. As the first woman member of council and vice-president of the Royal Society of Arts, she was later elected to honorary life fellowship of the Society. One organisation to which she gave much time and energy was the British Federation of Business & Professional Women. On its formation in 1932, she became its first chairman, later its president. In in 1950, she became the first British president of the International Federation of Business & Professional Women, providing leadership to women around the world. She also served as a vice-president of the British Electrical Development Association. Her gifts of stimulating thought and action in others were recognized by the Ministry of Labour in the recruiting and training of women for war-time engineering work. She was a member of the Woman's Consultative Committee and the Advisory Council of the Ministry of Labour, as well as the Advisory Council of the Appointments Department of that department. Other appointments followed. She was sent on several war-time government missions abroad, to the USA and Canada, Sweden and Finland, and to British Forces located in the Middle East. During 1945 and 1946 as World War II came to an end, Haslett was appointed chairman of the Hosiery Working Party set up by the President of the Board of Trade at the end of the war to revive the British hosiery industry, which had ceased manufacturing during the conflict. She was delighted when it again became possible for British women to buy nylon stockings manufactured in Britain. After the war she took a leading part in women's conferences organized by the British and American authorities in Germany. In 1947, Haslett was appointed a part-time member of the British Electricity Authority, formed to conduct the industry under public ownership. She served on the BEA and its successor bodies until her last illness in 1956. Another post-war appointment that gave her particular pleasure was to be a member of the Crawley New Town Development Corporation, as it related to her own home county of West Sussex.